Bone: Out From Boneville opens with its protagonist, Fone Bone, and his two cousins lost in the desert. Right away, adventure gamers will see that this is not a traditional adventure gaming moment – the desert looks normal enough, but the characters are anything but ordinary. The cousins Bone are cartoonish, off-white and vaguely humanoid. They don’t wear pants. They have used up their last supplies of food and water, but seem to have an inexhaustible supply of cigars. In this moment of crisis, their personalities show through. Cousin Phoney complains. Smiley brightens things up (or makes things worse, depending on what you make of his singing) by performing Camptown Races on the banjo. Fone tries to figure out how to get them out of the desert before they die of thirst. Bone is an interactive story with a point-and-click interface, viewed from the third person perspective. It’s based on the graphic novel series by Jeff Smith. Bone: Out From Boneville (the graphic novel) is colorful, funny, offbeat and oddly endearing. The game shares these characteristics. Bone’s strengths (I’m talking about the game now) are its characters, dialogs and environments. The game is in full 3D. Environments can be somewhat blocky and don’t feature as many details as do many adventure games with 2D environments. Still, they are attractively presented, with a different palette for each setting and the use of bright colors as accents. Once past the desert (which is lovely by torchlight) and into the Valley, Bone reveals a world that is straight out of a fairy tale. There’s a sunlit forest, a rocky stream, and a tree house in a clearing. You’ll meet a crusty old farmer, frolicking possum babies, and bugs that talk. You watch the drama as this fairy tale world meets the Bone cousins, who don’t look too much like humans but act that way – bringing the best characteristics of humanity (and some of the worst too) into the Valley. Like all fairy tale worlds, evil lurks in the Valley – there are hungry rat creatures and a more baleful presence, manifested as a menacing voice. The writing in Bone is excellent. There is quite a lot of dialog, and I enjoyed all of it. There aren’t that many game makers who can write consistently funny dialog up to the standard of the classic LucasArts games, but the developers of Bone meet this challenge (perhaps because some of them once worked for LucasArts). You can skip some of the dialog if you choose, and you can click through each line by hitting the space bar. But the heart of this game is the interaction between characters, and you’ll miss some of that if you skip or abridge what they have to say to each another. The game’s cutscenes are so smoothly blended with the regular gameplay that you are barely aware of them as cutscenes. Animation of the characters is good, and is in keeping with their cartoon-like appearance. The Bones’ eyebrows, which hover just above their faces, are animated with great flair. Each Bone has a characteristic walk, based upon his large feet – Phoney trudges, Fone toddles, Smiley slip slides (when he moves at all). None of them run, except during the chase sequences. There is one character with – how should I say this – a “normal” human face. Facial animation here is more problematic, and (for some reason) is better early in the game than late in the game. The music in Bone is varied, and adds to the ambiance of the locales. I liked it through most of the game, especially in the opening menu, though I did grow tired of the antic music in the possum clearing. 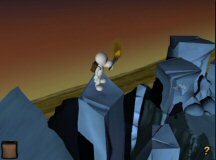 The ending of Bone: Out From Boneville is a satisfying one, with the fulfillment of one aspect of the game’s original quest. The Bone games are planned as a series, and there are a few hints late in the game as to mysteries yet to be solved. There is a dream sequence (or perhaps a flashback) featuring the sounds of a fierce battle and some strange glyphs spangled with stars. This leaves me with questions in my mind and an eagerness to see how the story is continued in the next volume. There are a couple of problems with Bone, and I sincerely hope that these do not call a halt to the series, because there is a great deal to enjoy in this game, and a huge amount of promise for the future. First, the game is short – I finished it the first time through in four hours. With my young son also playing and replaying it, I estimate that we’ve received about fifteen hours of enjoyment from the game so far. Bone is only available via download. I downloaded it in less than five minutes using a cable modem, but downloading the game using dialup will take considerably longer. I experienced two glitches while playing the game – once the flame from a torch became separated from its source. This was resolved by quitting the game and then reloading. The other glitch occurred during the final chase scene, when the game repeatedly minimized itself as Fone was running, terrified, from the monstrous rat creatures. Clicking on the task bar at the bottom of the screen brought me back into the game, usually at the stage where Fone was just about to be overrun and consumed. Again, quitting and reloading solved this problem. I also experienced some technical problems with activating Bone when the game was first released. My problem was solved by Telltale’s technical support, which responded to my email rapidly and with unusual good humor. The problem should be eliminated for anyone now downloading the game. Which brings me to the final issue: some of the gameplay in Bone features traditional puzzles. But most of the challenges are what you would expect in a game aimed at an audience that is, well, not action-oriented exactly -- but movement-oriented. Several challenges involve repositioning the player character over and over until you trigger a reward, such as a cutscene or a stealthy escape. Usually these challenges are time sensitive. There are two mini-games that are variations on hide and seek, one of which is surprisingly difficult because it is awkwardly clued. Bone does contain one of the best hint features I’ve seen -- this will be a significant aid to the gamer unused to these types of challenges. There are also two chase sequences that seem to go on forever. The last chase, which is the more difficult of the two, does not contain any place to use a saved game before the final cutscene is triggered. To enjoy the game’s culmination and find out how the story ends, you must win the final chase on your own. Bone: Out From Boneville aims at a wide audience of gamers – adventure gamers, casual gamers and youthful gamers. In one sense it succeeds best with the youthful gamers – my nine-year-old son played it three times straight and loved it. Dialog in the game is set up so that (though he didn’t know it) the game was expanding my son’s reading skills. Still, if Bone were aimed primarily at this youthful age group, you wouldn’t expect the humor to be quite so sophisticated, or for other things to appear in the game – the use of expletives, for instance, and the use of cigars as a treasure hunt item. Will Bone succeed with casual gamers? It very well might, though the story and the focus on getting to know the characters makes it a game that is not easily played for an hour, left for a week, then picked up again for another hour of play. How about adventure gamers? This is the audience most likely to hear about Bone. Many fans of LucasArts will want to know what a team with a LucasArts pedigree is producing, and these fans will probably feel right at home in the game. Adventure gamers in general will enjoy its droll humor and the promise of more appealing interactive stories based on the series. Gameplay, however, is more movement-oriented and time-sensitive than the typical adventure gamer is expecting to see. Third person perspective, point-and-click interface. A charming, fairy-tale-like story with funny dialog and engaging characters. Excellent voice acting. Some time sensitive challenges, including two chase scenes. A wide variety of puzzles – inventory challenges, a strategy puzzle, sequences in which you must position the player character in exactly the right spot. No sliding tile puzzles, one easy maze, no sound puzzles, no puzzles in which color discrimination is necessary. Eight save slots – twice that many would have been about right. Two easily resolved game glitches. The game is stable. You can die, but are brought back to the moment before you end up as a potential steak, stew or quiche. Expect about four hours of gameplay (longer if you’re incompetent at the chase scenes). The game is a fun replay, especially for youthful gamers. Bone: Out From Boneville is available via download-only by clicking here - TellTale Games. This game is aimed at a wide audience of gamers, especially those who enjoy idyllic, yet unconventional worlds, spirited characters and snappy dialog. Ideal audience: families that game together. Editor's Note: The glitches mentioned in the “We’ll Devour You Quite Messily” section of this review -- including the activation problem -- have all been eliminated in the current downloadable version of Bone: Out From Boneville. The current version also allows you to bypass some of the mini-games, including both chase sequences, if you choose.